PUNE: Pune’s strategic location - thanks to the city’s connectivity to major cities, holiday destinations and pilgrimage sites - makes it a magnet for heavy tourist rush. The effect of this rush is most telling on traffic and the increasing number of road accidents in the city and its outskirts. Experts say most stand-alone destinations in Maharashtra are day-tour destinations, located within 150-200 km from major cities like Mumbai, Pune, Aurangabad, Nagpur, Nashik, Kolhapur. This means the tourist flow continues on most days. But the traffic load on the Mumbai-Pune Expressway is immense during holidays. In December 2017, during the Christmas weekend, the Pune-Mumbai Expressway experienced day-long traffic snarls - brought on by a major accident and several small vehicles breaking down due to overheating. Many accidents on this expressway are caused by speeding tourist vehicles. Girish Makhijani, from Harekrishna Comfort Tours, says, “Most tourists heading to nearby destinations are not seasoned drivers, trained to drive on ghat roads. There have also been instances of drunk youngsters driving on the highways. Most of the accidents are reported during the tourist season. There is a spike in the number of road rage cases as well. 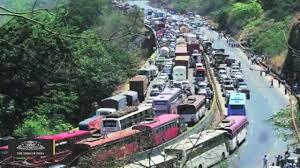 When drivers are stuck in jams for hours, they often get frustrated.” He said Pune is a transit spot for many travellers from Hyderabad, Delhi, Bangalore and even Rajasthan. “From Pune, these travellers go to destinations like Shirdi, Shani Shingnapur, Mahabaleshwar, Lonavala, Khapoli and Nashik,” he says. Yatish Devadiga, of PMP Pravasi Manch, says tourist and state transport buses add to the rush. “When there is an increase in congestion, there is an increase in the probability of accidents,” he says. Ranjit Gadgil, programme director at Parisar, says tourist-flow in the highways around Pune is on a rise and is bound to increase further when the Purandar airport comes up. “All vehicles speed at night because the highways are empty. The authorities must enforce speed limits by identifying spots where over-speeding is rampant. Authorities must use speed guns and vehicles violating norms should be stopped and issued ‘chalans’,” he adds. A state highway police official says action is taken against any vehicle violating norms. “Though there is no specific action on speeding, an action is taken against rash, negligent driving,” he said.